Do you believe in the redemptive powers of noodles? Do you have faith that a flavorful broth tended to with heart and emotions, as well as skill...can transform your mood? How about finding your calling in a place previously foreign to you? The Ramen girl is a story that will make you hungry and eager to travel...and eat magical bowls of Ramen all at the same time. Far-fetched? Perhaps. But isn't that the fun in it? Being taken out of your skin for a couple hours and landing in Japan...ready to cast off your needy, sorry self and become confident and renewed? A foodie chick-flick at its finest. Let's see what inspiration everybody drew from our November (turned December) flick... 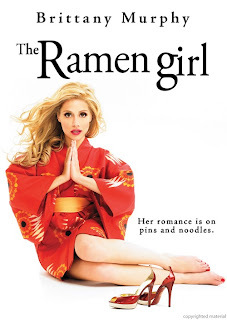 The Ramen girl. Deb from Kahakai Kitchen says that "a girl needs a good chick flick now and then..." and I totally agree! 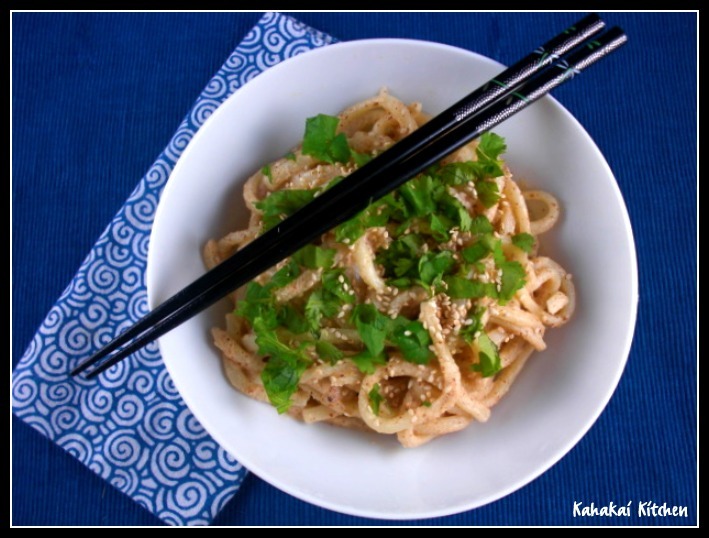 I remember Deb doing her first review of The Ramen Girl, and she is just so awesome that she made a variation on her first dish and joined us this month! Deb made an Asian Pesto Udon that was "A little smoky--I used "smokehouse" almonds, a little kick of ginger and creaminess from the almonds and the coconut milk, this is a unique sauce that tastes great on the thick noodles. I tried it both hot and cold and I am not sure which way I like it best--texturally I preferred it warm, but some of the flavors like the ginger seem to come out more when it is cold. I liked this a lot, it is different but really good." Tina from Life in the slow lane at Squirrel Head Manor is battling a nasty cold that foiled her plans, so she combined two unlikely friends...chicken soup and ramen...okay, not that unlikely...to come up with a comforting bowl of Chicken Ramen Noodles this month! Kim from Stirring the Pot went a different route...she didn't make soup...but she did spend 15 hours on her labor of love Italian Braised Beef w/ Root Veg...and ate it over some fat noodles! 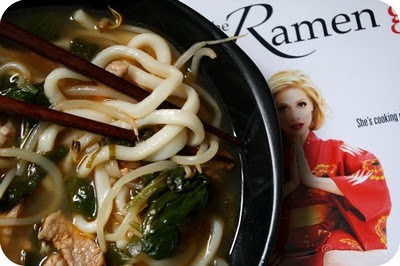 Kim says "In the movie The Ramen Girl, the broth for the ramen noodle soup was the heart of the recipe. In Symon's Italian Braised Beef, the sauce is the heart of the recipe. Full of complex and robust flavors, which have cooked and simmered for hours upon hours, it is what makes this recipe so good." . I (Heather from girlichef) watched this movie a few times...and always find myself wanting to lessons from a Ramen Master!! I'm so easily allured by food, learning, history, and new cultures. What can I say? I wanted a flavorful broth filled with fat noodles and tasty goodies and think I accomplished that with my Noodle Soup w/ Pork, Beans Sprouts, and Spinach! Let's not forget Ree from Milk, Sugar, Musings & Love...my partner in crime over here...she was "excited to step outside of my culinary comfort zone to make something with a Japanese flare inspired by the film. This recipe was simple, quick and delicious. I loved the shrimp especially!" 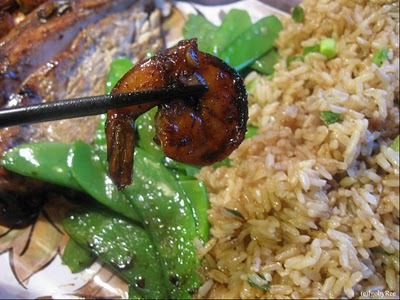 She cooked up some mouthwatering Ginger Glazed Mahi & Shrimp. Looks pretty comfortable to me. Our roundup was short...but oh-so-tasty this month! Thanks to everybody who participated...my mouth is watering. Completely! Watch for Ree's Waitress roundup coming soon...and the announcement post for our next chosen Flick! lovely round up-hope to participate in your future flick event ! I just sent in my submission! I know, I know...I'm late. That's the story of my life. LOL. All the dishes look absolutely fab.